(TibetanReview.net, Jul23, 2014) –Apparently not satisfied with the enormous human, financial, and diplomatic resources it had committed to create a positive media image of its rule in occupied Tibet, China has created a large number of fake twitter accounts in mostly western personal names – often an odd combination of two first names – in an attempt to boost it badly tarnished image there. London-based Free Tibet campaign group which reported on it has said Jul 21 that while its researchers have uncovered around 100 such fake accounts, there could be hundreds more. The postings paint a glowing picture of Chinese rule in Tibet with propaganda contents taken from Chinese government-run websites, while vilifying the Dalai Lama, Tibet’s exiled spiritual leader whose popularity among Tibetans and in the outside world is severely resented by the Chinese leadership. The fake accounts were detected recently but some of them, though not especially active, dated back to 2012, Radio Free Asia (Washington) Jul 21 cited Free Tibet spokesman Alistair Currie as saying in an interview. He has said the group found the fake accounts two weeks back and had been doing research on it since then. Many of the tweets repeat glowing accounts of China’s development policies in Tibet, including Tibetan appreciations of the Chinese rule, while others condemn the Dalai Lama with false accusations. One of the tweets, reposted 6,555 times, is said to suggest that the Dalai Lama while visiting the West, is “just looking for more money.” The Dalai Lama, of course, always requires his hosts to make public the financial accounts of his visits, including with announcements of donations of the surplus generated from them to charities, taking no amount for his personal use. The fake account holders were said to have tweeted identical or very similar content, sometimes simultaneously, with the postings having “minimal ‘personal’ content” but instead providing links to Chinese government’s Tibet-related sites. According to Currie, China’s recently uncovered messaging efforts are apparently aimed at pushing “pro-China propaganda higher up the search rankings on Twitter when people search for “Tibet” or “#Tibet”. 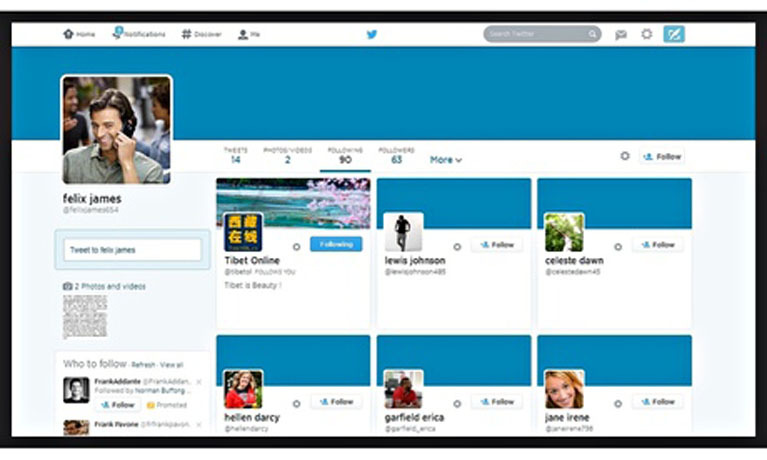 Free Tibet has urged Twitter to investigate and delete all such accounts found to be fake. Impersonation is a violation of Twitter’s rules. The New York Times Jul 21 cited Twitter spokesman Jim Prosser as saying Twitter works hard to uncover and delete illegitimate accounts. And according to Voanews.com Jul 22, Twitter had suspended many of the fake accounts found in the New York Times report by early Jul 22. Twitter and all other major Western social media are blocked in China, so the purpose of the faked accounts are designed to influence western opinion about Chinese rule in Tibet where at least 131 Tibetans have staged self-immolation protests since Feb 2009 and where the international media is banned while tourists are subjected to numerous kinds of restrictions.